It’s a tradition at WHAP for the Wolves to get freshly baked pumpkin pie on Thanksgiving. They love the whip cream and seem to be starting to actually enjoy the pie! Enjoy the video below and make sure to stay tuned even when the screen goes black as there is a lovely howl from Thanksgiving evening. It was dark when I took it so there is no video but enjoy their beautiful song. They are all doing well. We have had some beautiful weather, perfect days and chilly nights. Their spirits seem to be lifting a bit. Breeding season is creeping up on us so there is some tension between the girls. Woha and Ohoyo are trying to bite each other through the fence. Woha is also trying to dig a den as she knows those lazy boys sure won’t do it. Niko is also displaying dominance to Wa-ta-chee. Tach is good at knowing when to fold so I don’t anticipate any major problems between them. Us caretaker Elves are busy, busy printing shirts, hoodies and packing orders for the Holidays. We appreciate all of you who help us support them by ordering from out gift shop. I hope even though our Wolves are seniors that you will still adopt them. They are the ones that need you most. 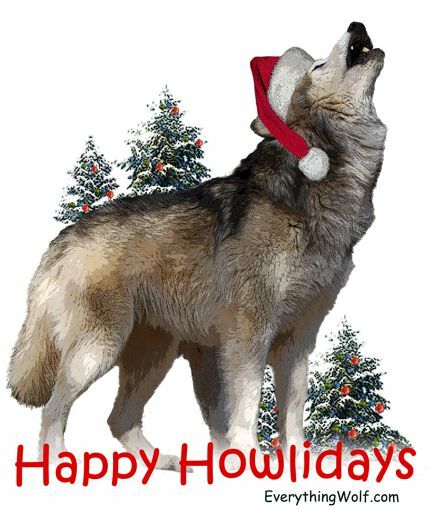 Have a very Happy Holiday Season with your pack! We will see you with video of our Christmas celebration in 2018. Howls!